Peter Case’s new album will be released later this year, but as he’s in his early 60’s now, he’s got quite a long career to look back on to, although unfortunately he’s not quite blessed with the amount of success he definitely deserves. Starting his career in earnest in the mid-1970’s in San Francisco, he played with seminal Power Pop heroes The Nerves and The Plimsouls in the late 1970’s and early 1980’s. Most interesting for me however, was the solo career which he started with his self-titled album in 1986 and 1989’s The Man With The Post-Modern Fragmented Neo-Traditionalist Guitar. Both are very fine albums taking me right back to, what was for me, the most formative and probably the most exciting musical period of my life, with bands such as The Blasters, The Beat Farmers, The Long Ryders, The Del Lords, Jason & The Scorchers, X, Los Lobos, Lone Justice and countless others. Haven’t listened to both albums in ages (a fact I plan on rectifying rather sooner than later), and the same is true for Sings Like Hell. Like all albums close to your heart you never completely forget about them though, so I picked it up again recently – and, nor surprisingly, I love it as much nowadays as I did back in the mid-1990’s. I got hold of it through the record label, Glitterhouse Records, for which I was working for around that time and who released the album in Europe in 1994 (it was released on his own Travellin’ Light label in the US and was thankfully re-released through Vanguard Records which means it is still widely available). And if you are, like me, into primitive, old-fashioned and (at times) raw Folk-Blues sounding a lot like an updated version of Case’s Blues heroes from the first part of the 20th Century, it’s an album that should not be missing from your record collection. More than his first two solo records, Sings Like Hell was for him a return to the styles and sounds he was inspired by as a guitar player, as his early inspiration were artists like Lightnin’ Hopkins, Robert Johnson, Mississippi John Hurt and Skip James. Where he was accompanied by a host of other players in those first two solo records, here it’s only a small group of fine musicians, accompanying him on a limited number of tracks, drums and bass for example are only to be heard on Walkin’ Bum and Well Runs Dry. Naturally, I like the more folk-influenced songs on here best, especially Lakes Of Ponchartrain, Roving Gambler, Rose Conolly and How ‘Bout You. Lakes Of Ponchartrain, like most of the songs on here, is a traditional, but I don’t think there was ever a better version recorded. It’s slow and sweet, with Tammy Rogers’ violin coupled with Case’s harmonica and guitar making it one of the most gorgeous songs I have ever heard. Roving Gambler is even more simply arranged with only Case and his acoustic guitar – but that’s all you need when a great song is done by somebody as talented and good as Case. Rose Conolly’s pretty tune (much like that other famous murder ballad Knoxville Girl) belies the gruesome story about a cold-blooded murder. Jesse Winchester’s How ‘Bout You is another track arranged in a very understated manner with just an acoustic guitar and (producer and ex-Lone Justice) Marvin Etzioni’s mandolin. Waltz Of The Angels is another slow and tuneful ballad (again graced by Roger’s violin). However, the decidedly more blues-oriented songs on here don’t disappoint at all either. Album opener Brokedown Engine is as raw as they come on here and setting the mood of the album in fine style. Case’s version of Arthur ‘Big Boy’ Crudup’s classic So Glad You’re Mine sounds quite different, but at the same time as authentic as you can hope to, about 50 years after it was first recorded. Especially good too is Blind Lemon Jefferson’s Matchbox Blues, it’s very cool, highly entertaining and downright catchy with some very fine guitar work by Case. Down In The Alley, for a change, is arranged only with a glorious, stomping honky-tonk piano, harmonica and vocals. The shouty Well Runs Dry is piano-led too, but, as noted before, arranged with bass and drums so it’s the fullest-sounding and most ‘rocking’ track on Sings Like Hell. Case’s only composition on here, the fabulous North Coast Blues is testament to his songwriting skills and fits on the album perfectly well and in convincing style. Quite a few songs on Sings Like Hell remind me of Dylan’s early work, the rough-around-the-edges guitar playing and overall sound, and the rather high and nasal, raspy voice. What was working for Dylan on Another Side Of is working on here brilliantly too. Another album springing to mind as a comparison, is the Alvin Brothers’ 2014 record Common Ground, if not exactly in sound, but in spirit. 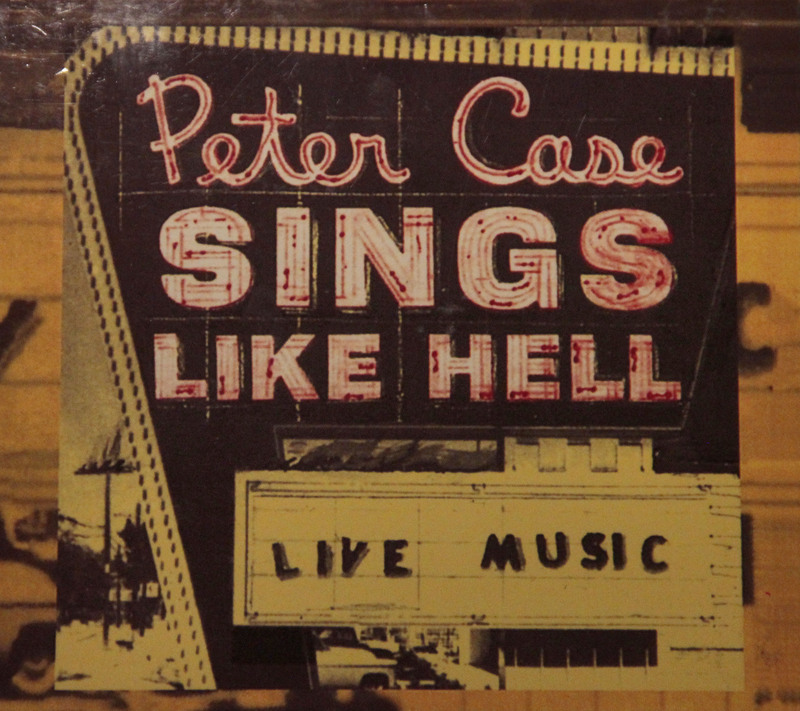 Having yet to listen to the first two records again in depth, my verdict ist still out, but Sings Like Hell might very well be my favorite Peter Case album, it’s most definitely the most original and the coolest. This entry was posted in Music and tagged Folk Music, Folk-Blues, Glitterhouse Records, Guitar Rock, Music, Peter Case, Power Pop, Reservation Blues. Bookmark the permalink.